As a Nigerian growing up in predominantly white Hull in the 1970s and 80s, Christopher Alder's early life and upbringing alone would have made a compelling addition to our collection of African Stories in Hull and East Yorkshire. However, his shocking death in 1998 has given his story added significance. Left to die on the floor of a police station custody suite, his final moments are an important document of the negative side of the Black experience in Yorkshire and Britain as a whole. 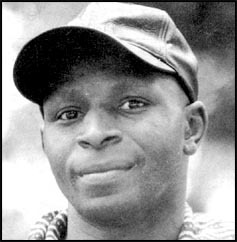 Christopher was born in Hull in 1960 to Nigerian parents who had emigrated to Britain in the previous decade. His father was a merchant seaman, and, with Christopher’s mother, had settled in Hull after securing employment with Reckitt & Coleman. The intention was to set up a better life for their future family. However, their mother suffered heavily with post-natal depression, which worsened after the birth of each of their five children, and the children were taken into a care home after 1962. As the only Black family in the home, the Alders grew up as outsiders. When asked about the care home experience, Janet Alder, Christopher’s only sister, says of the time there had "not been such happy memories at all". Moving from Hessle Homes to Marlborough Avenue, the unsettled children found solace in athletics at school, excelling in a number of sports. Then, at sixteen, Christopher joined the Army, serving in the Parachute Regiment for six years. After leaving, he spent time in Andover, Hampshire and had two sons in the 1980s. He moved between there and Hull across the decade, before resettling in his hometown in 1990. In 1998 he was taking a computer-programming course, with hopes of pursuing a new career. One of the many shocking aspects of what happened on 31 March 1998 is simply how such normal, routine events spiralled out of control. On a Tuesday night out with a couple of friends, Christopher had drunk a couple of pints of beer and had visited McDonalds before heading to Hull's old town at 10.30pm. His destination was The Waterfront Club, now known as The Sugar Mill - one of Hull's biggest nightclubs. In the club a little later, he ran into an acquaintance, Jason Paul. Paul and Christopher were not on good terms, and an 'altercation' occurred between Christopher, Paul and his associates, resulting in Paul and company leaving the club around 1.30am. To hear Janet tell it, the fight stemmed from a previous encounter in a club a couple of weeks before. Christopher's niece had seen Paul kissing a girl, and had informed Paul's girlfriend. This provoked an angry reaction from Paul, who confronted Christopher's niece, and Christopher had intervened. Two weeks on, hostilities had resumed. Paul and his associates were outside when Christopher left at 2.15am, where a fight ensued, leading to Paul punching Christopher. The punch caused Christopher to fall onto the waterside cobbled street, hitting his head on the pavement and losing consciousness. The blow was heavy, but not life-threatening. The Waterfront's staff came to his aid, and called an ambulance. By the time of the ambulance's arrival, Christopher had regained consciousness, and was taken to Hull Royal Infirmary. So, a fight on a night out, and a man had been knocked unconscious. Nothing overly shocking perhaps. It was the following sequence of events that turned the ordinary into the diabolical. On arrival at hospital at 2.44am, Christopher was described as being abusive to staff - possibly due to a combination of intoxication and disorientation due to his injury. He didn't want an x-ray, but the doctor determined that he had sustained a haematoma to the rear of his head caused by impact, and a few other minor injuries sustained in the fight. After finding Christopher in this uncooperative state on their arrival at the hospital (and their first meeting with him), the police arrested him to prevent a breach of the peace. At some point between Christopher's arrest and his arrival in the custody suite, he fell unconscious again. Police later described him as "asleep" and "snoring" in the back of the police van. For anyone who has viewed the deeply disturbing CCTV footage available online, it is evident that something is seriously wrong. From the moment this 38-year-old father-of-two is dragged through the doors of the custody suite, trousers around his ankles, totally unresponsive, the scene is alarming. As Christopher’s throat gurgles, struggling and failing to breathe, a pool of blood forms around his mouth. The police do not make any attempt to rouse him until they realise, too late, that he has stopped breathing. An ambulance arrived on the scene at 4.04am, and the paramedics stopped CPR half an hour later. This man's casual night out with a couple of friends had ended in his death. Even without the wider social and contextual factors, to anyone who reads the facts, or who views the CCTV footage of the custody suite, it is obvious that Christopher died due to serious professional errors. As a report by the Healthcare Commission found in 2006, there was “a failure to pass on key information from the ambulance to A&E staff, and from the A&E staff to the police, and finally from the police to the ambulance staff.” A man had been punched in the head and had a clear head injury. Yet, key information was not passed from one department to the other, and Christopher’s condition suffered as a result. For Janet Alder, the subsequent years have been a prolonged struggle to hold the people involved to account. An inquest in 2000 ruled that Christopher had been unlawfully killed, but this verdict was then challenged in a legal case backed by the Police Federation. The challenge was dismissed in 2001 by the High Court of Justice and the officers were charged with manslaughter in March 2002. Yet, this trial collapsed when the judge ruled officers not guilty on all charges, and an internal police disciplinary inquiry cleared the officers of any wrongdoing. Janet has first-hand experience of these enquiries, and describes the outcomes of them as highly unsatisfying. In April 2004, BBC television series Rough Justice broadcast "Death On Camera", a programme examining the circumstances of Christopher's death. The public concern that it raised triggered Home Secretary David Blunkett into asking the Independent Police Complaints Commission (IPCC) to review the case, resulting in a report published in March 2006. The officers were found to be guilty of "unwitting racism" and the "most serious neglect of duty". Eight years on from Christopher's death, this provided little consolation to Janet, as four of the five police officers had been granted early retirement on stress-related grounds fifteen months earlier. To date, the IPCC report is the last major investigation into Christopher's death. The government issued a formal apology to the Alder family as ordered by the European Court of Human Rights (ECHR) in November 2011. However, around the same time, Christopher was granted a further indignity as his body was discovered in a mortuary. After an exhumation of his grave, it was discovered that 77-year-old Grace Kamara had been buried in his place. Janet is still fighting for what she believes to be justice. She is unsurprisingly unsatisfied with the belated apologies and denials of responsibility from the authorities. She is still dealing with the aftermath of a simple night out which spiralled out of control. Negligence from professionals and a total lack of human compassion for a suffering Black man led to a completely avoidable death. And the quest to hold people to account goes on. Janet feels that with the police policing themselves, she may never find closure. Read on for further information about the Christopher Alder story, including videos and media reports. You can listen to Janet Alder talk about her brother Christopher's death in the interview below.